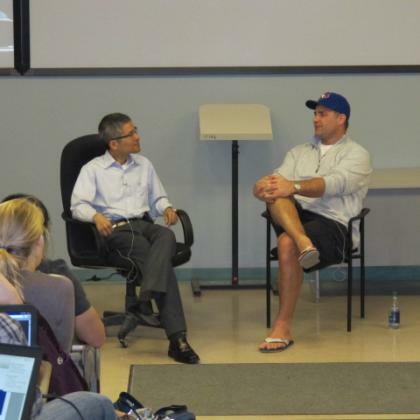 Retired NHL hockey great Eric Lindros sat down with Neurosurgeon Dr. Wai Ng, to discuss concussions and brain injury in a second year medicine class today. He told the students he had his first of several concussions when he was playing junior hockey in the OHL. "It was probably when I was 17. I just felt off," says Lindros. "I didn't realize it was a concussion at the time. We just called it an upper body injury. "Awareness has gotten a lot better. Unfortunately, it has been because of prime players getting hurt, Sidney Crosbie for instance." This is the second time Lindros has taken time out to speak to medical students about his experience. The native Londoner says he couldn't say how many concussions he's had. But he remembers the severe ones. When asked about symptoms, Lindros recalls how it dragged him down. He felt tired, anxious, headachy, and lights bothered him. As for recovery, "Time is your best friend with it. But it's hard. You want to go out and play. Your coach, your teammates, everyone wants you to go out and play." He says financially it can be hard to sit out; you worry about who is going to replace you, and you don't want to be labeled as concussion-prone. Lindros started his NHL career with the Philadelphia flyers, after refusing to go to the Quebec Nordiques in the entry draft. He also played for the New York Rangers, Toronto Maple Leafs and Dallas Stars before retiring in 2007. That year he also donated $5 million dollars in support of London Health Sciences Centre. The 40 year old told the medical students he has no recurring problems from his concussions. "I feel good. I feel healthy. I feel strong. Taking the time I did (to recover) helped me out for the rest of my life."